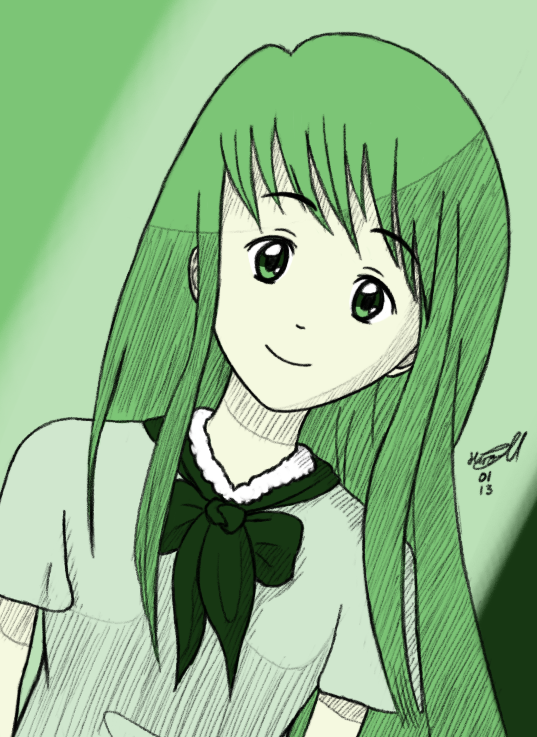 Stray Scribbles - "Green Girl"
The other day I saw a picture which looked kinda like this and I liked it so I tried to mimic it here. I think it turned out pretty well; it’s a lot easier to get the shape of things right when you have another picture to look at haha. 🙂 I did change a few things such as making her fringe bangs, and the outfit changed into.. an unusual school uniform? Heheh. I wanted to do a picture which had a colour theme, using as few colours as possible but just changing the shades/tints involved. In this picture I went with a soft green, and I kept the same hue for every colour I used (except the skin tone which is a bit more yellow haha). I also went with purely same-direction diagonal hatching, which makes the picture look more simple if done right. I like the shape of the eyes in this one. They’re almost more a triangular base, even the irises are a little pointy, and they have some little details which look quite nice. I’m going to try doing eyes more this way more often I think.